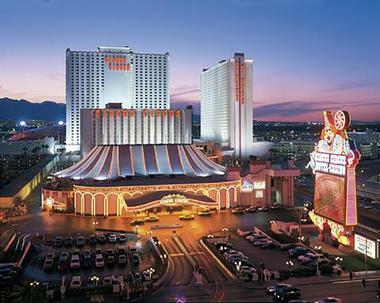 Las Vegas is well known as the Entertainment Capital of the World, with many activities for families with kids. 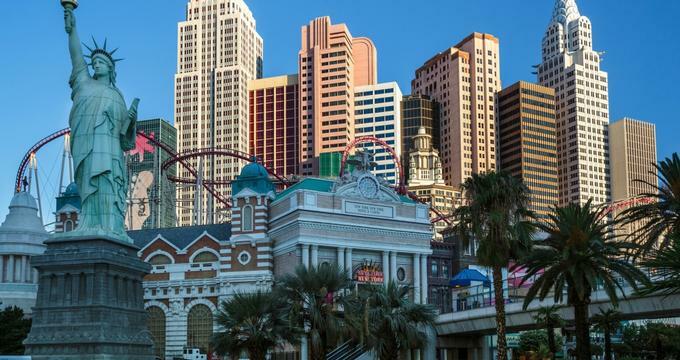 From shows like Blue Man Group to riding the Big Apple Coaster over the Las Vegas Strip and flying down a waterslide through a three-story shark tank, Las Vegas is about so much more than bright lights and gambling. Many resorts and hotels in Las Vegas cater specifically to families looking to experience a different type of entertainment. Only in Las Vegas can guests see the Eiffel Tower, a medieval castle, and Venetian canals in the same place. One of these iconic landmarks is the great pyramid at the Luxor Hotel and Casino, an Egyptian-themed resort personified by a 30-story pyramid, albeit one that’s a little bit more flashy than the ones in Egypt. 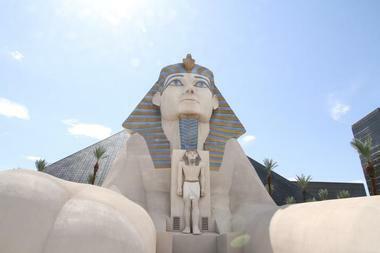 Families staying at the Luxor will love the four swimming pools, flanked by sights like the pyramid and a huge replica of the famous Egyptian Sphinx, retail shops, and fantastic shows that feature international artists and performances like Blue Man Group. 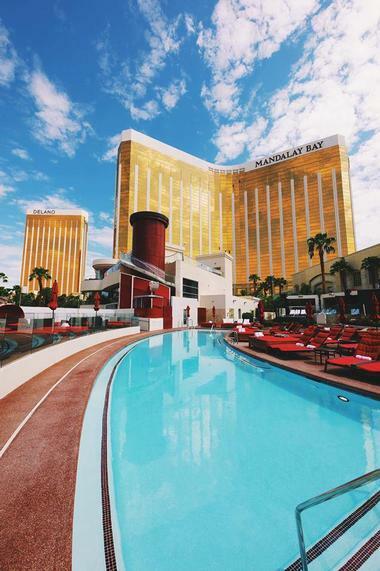 Although Nevada is a landlocked state, the beaches and pools at Mandalay Bay will make visitors feel like they are on a tropical island resort. Mandalay Bay Resort and Casino boasts upscale, comfortable rooms, top-notch service, and an 11-acre beach with almost 3,000 tons of real sand. Guests can lounge in the sun or under the shade of a private cabana as they enjoy the massive wave pool or the lazy river. Inside the hotel, guests can visit with over 2,000 species of fish and animals in the Shark Reef Aquarium, which contains an underwater tunnel so visitors can see ocean life all around them. The MGM Grand, located at the south end of the Strip, is another Las Vegas classic that’s difficult to miss. 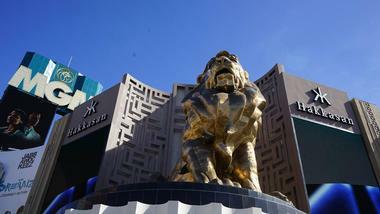 The massive green casino and resort is guarded out front by a bronze lion that stands 45 feet tall. At MGM, guests can battle zombies, robots, and more in the virtual reality arena, play a game in the four-story Topgolf entertainment complex, or enjoy live shows from famous musicians and artists. There are four swimming pools at the MGM Grand as well as a spa and a lazy river, so guests have a huge variety of options for entertainment and family fun. 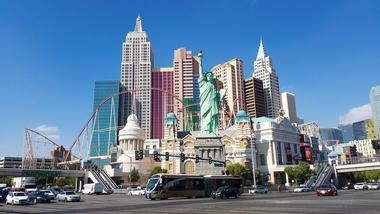 Another way to travel the world by staying in Las Vegas, the New York-New York Hotel and Casino offers New York City classics like the Statue of Liberty and brightly lit towers that resemble the distinctive skyline of the Big Apple. The resort is a great place to see plenty of fantastic shows by touring artists and Las Vegas residents as well as explore the shops and restaurants of The Neighborhood, a spectacular place that gives guests the time of their lives with a New York flair. And for a real treat, visitors can play classic arcade games and soar above the Strip at heights of over 200 feet and speeds of 67 mph on the Big Apple Coaster & Arcade. At this lavish Italian-themed hotel and casino, guests can relax in a beautiful suite or enjoy a meal at one of over 20 restaurants on the premises. 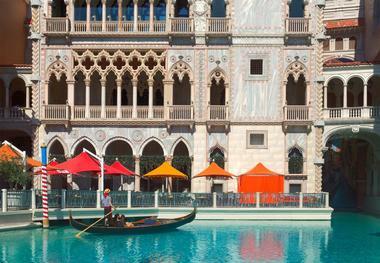 Well known for its artificial canals, families and kids will love taking a ride in one of The Venetian’s gondolas, which will take them past the shops and villages of the resort, all of which are designed to resemble Venice, Italy, and classic Italian architecture. The calendar of shows at The Venetian is jam-packed with famous names of musicians, and nightly events and shows mean there’s always an abundance of entertainment options. The Venetian is also home to Madame Tussaud’s Wax Museum, where visitors can rub elbows with recreations of some of the most famous faces in Hollywood. Red Rock Casino Resort and Spa is located about half an hour from the Strip, and it’s a favorite destination for vacationing families in Las Vegas. The resort offers amazing views of nearby Red Rocks Canyon, where guests can visit for some great hiking trails and biking and kayaking opportunities. The 3-acre resort is home to nine swimming pools with plenty of lounge chairs as well as ten restaurants and great, spacious rooms. Families can engage in a little friendly competition at the resort’s bowling alley, which is the biggest in Las Vegas, catch a film in the attached movie theater, or play some great classic games in the arcade and kids club. South Point Hotel and Casino is located in the suburbs of Las Vegas, about a 15-minute drive from the Strip, however, its huge casino, combined with a family-friendly atmosphere and plenty of amenities that cater to a wide variety of interests, makes it a wonderful place to take kids on vacation. 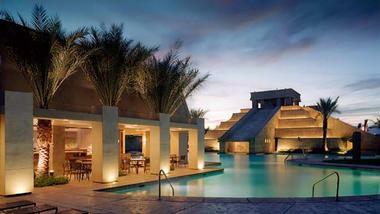 The hotel has spacious rooms, large pools with lounging areas and fountains, and 11 restaurants for its guests to enjoy. There is even a movie theater with 16 screens and a bowling alley with 64 lanes that has separate areas for professional bowlers and families and groups who are there to have fun. There’s even an equestrian center, where guests can take a riding lesson or go for a trail ride in the Nevada desert. The accommodations at Tahiti Resort are all suites with incredibly spacious rooms, living spaces, and fully equipped kitchens. Tahiti Resorts even offers room-delivered groceries, so families with kids don’t even need to step out their door for dinner ingredients. 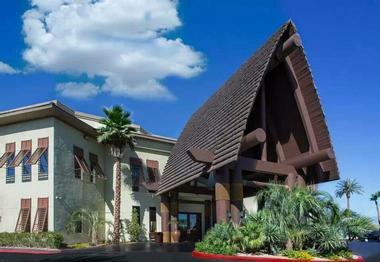 Guests staying here will feel a little taste of the South Pacific, as Tahiti Resort prides itself on being an oasis within the desert of Nevada, with tropical landscaping, thatched roofs, and a decidedly exotic feel. Guests will enjoy the two 24-hour pools on the property, with built-in rock formations that kids will love to climb and play on, and a putting green where everyone can try out their golf swing. 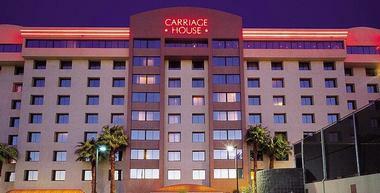 The Carriage House is located just a block from the Strip, so it’s a quick walk for those looking to enjoy the lights and excitement of Las Vegas, but far enough away that it offers a quiet retreat from the noise. Families at The Carriage House can enjoy the use of an outdoor, heated pool, which is open for most of the year, and amenities like free Wi-Fi in all rooms. Standard accommodations include an in-room kitchenette, and an upgrade to a suite will include a full kitchen and walk-in closets. 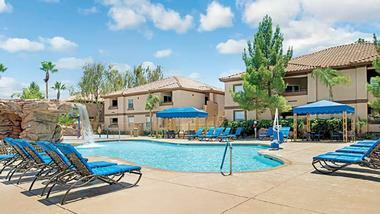 There is a tennis court and a basketball court also on the property, and parking at The Carriage House is free. 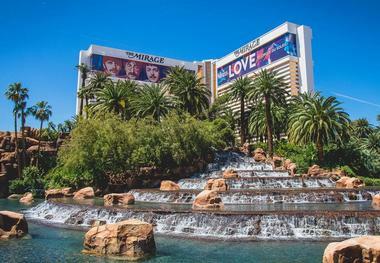 The Mirage is another Las Vegas staple, with luxurious rooms and a huge swimming pool. At The Mirage, kids will go wild for the volcano, which erupts every night at 8pm and 9pm (and again at 10pm on weekends) in a spectacular show of lights, flames, and pyrotechnics, all set to a thrilling musical score. The restaurants here offer kids’ menus, and the California Pizza Kitchen is a special family favorite. Families can also visit Siegfried and Roy’s Secret Garden and Dolphin Habitat, which is home to big cats like lions and tigers and has a massive saltwater aquarium for dolphins. 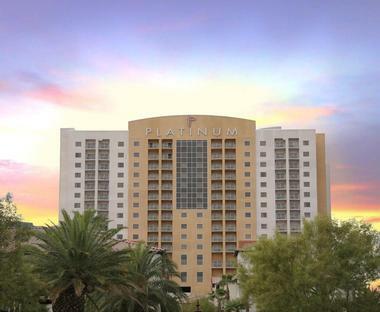 The Platinum Hotel and Spa offers huge suites to its guests, with options that range from 900 to over 2,000 square feet. These incredibly spacious options are fully equipped with kitchens, living areas, and walk-out balconies, and families staying at The Platinum will appreciate the space for kids to run around and play. The spa is a great place for parents to relax and treat themselves to a massage or a facial, while the kids splash in the indoor and outdoor swimming pools. 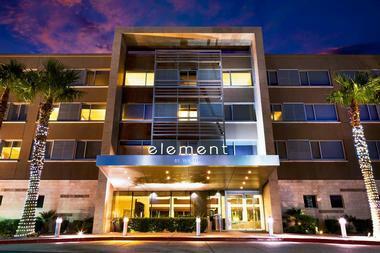 The Platinum Hotel and Spa does charge a daily resort fee for use of its amenities. The Vdara Hotel and Spa is a gaming-free building, which means it’s great for families and guests who are looking to explore parts of Las Vegas besides the casinos, although it is close enough to the Strip that some rooms even have a view of the Bellagio fountains. The all-suite hotel offers plenty of amenities to its guests, including Wi-Fi, living rooms and dining rooms, and kitchens. It’s a pet-friendly hotel, so families can even bring their dog on vacation, and a dog park on the property will ensure that even the family pet is having a great time. 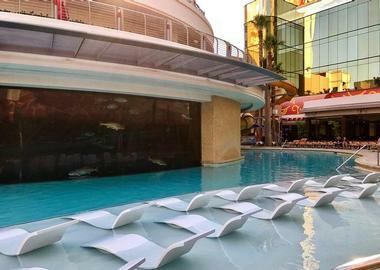 Salons, restaurants, pools, and lounges offer all the ingredients for a lovely stay at The Vdara. Located just over a mile from the Strip, the Wyndham Grand Desert Hotel has huge suites, three beautiful swimming pools, and free shuttles to and from the Strip. It is full to the brim with family-friendly fun, and there’s even faux gambling for the adults, so they can enjoy all the fun of the Vegas casinos without losing all the money in their pockets. Every day, the Wyndham plans activities for kids, like ice cream socials, treasure hunts, and tournaments, so parents can take a break and enjoy some more adult entertainment. There are also plenty of other things for kids to do, like playing games at the mini-arcade or taking part in some structured arts and crafts with the hotel staff. Located close enough to the Strip to be still easily accessible but far enough to be away from all the hubbub and craziness of the never-ending party, Cancun Resort is a great destination for families looking to enjoy a relaxing getaway in the City of Lights. An iconic Mayan-style pyramid serves as a backdrop to a stay full of relaxing swimming pools, a poolside cafe with delicious food and drinks, and four huge waterslides for visitors of all ages to enjoy. There is also a game room and plenty for the kids to entertain themselves with while the adults enjoy an afternoon at the spa or lounging next to the pool. This fun casino hotel is full of vibrant colors, bright lights, and fun for the whole family. Circus Circus Hotel and Resort is, as the name implies, a circus-themed hotel, complete with a carnival midway where guests of all ages can step right up and try their hand at classic carnival games like skee ball, ring toss, and dart throwing. Lucky guests may even go home with a giant stuffed teddy bear as a souvenir prize. Circus Circus also offers the Adventuredome, the largest indoor theme park in the country, where guests can battle it out on bumper cars or glide along on a carousel. 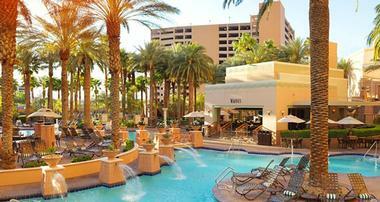 Desert Paradise Resort offers a respite from the hustle and bustle of the Las Vegas Strip. The one and two-bedroom suites at Desert Paradise Resort are furnished with king-sized beds as well as an in-room laundry and a fully equipped kitchen and dining area, so guests can feel right at home away from home. Families and kids will enjoy the full-sized swimming pool, kids waterpark area, and game room, which is equipped with pool and foosball tables. Desert Paradise Resort is conveniently located to dozens of exciting Las Vegas attractions, including shows, museums, casinos, and restaurants. The 52-story Elara by Hilton Grand Vacations is a beautiful upscale hotel located in the heart of all the action in Las Vegas. Its location, right next to the Planet Hollywood Resort and Casino and just across the street from the Miracle Mile shopping center, which is home to almost 200 shops and restaurants, makes it a great location for exploring Las Vegas. The hotel’s dining options feature everything from room service to a poolside bar and grill so that guests can enjoy a drink, a snack, or a full meal while lounging by the pool or from a private cabana. Rooms vary from a traditional hotel room all the way up to four-room suites, so no matter how big the family is, everyone will have plenty of space. 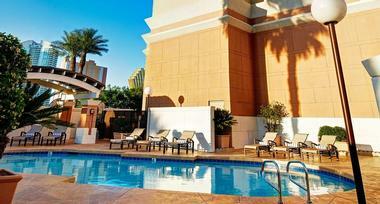 The Summerlin Hotel is an extended stay hotel in Vegas that is perfect for families looking for a place to stay. All of the rooms are studios or suites with fully equipped kitchenettes, so guests can have the option of foregoing the pricey restaurants of Las Vegas in favor of a home-cooked meal. The hotel also offers a daily complimentary breakfast bar and evening receptions on select days throughout the week. For an extra fee, the hotel is even pet friendly, so pets under 40 lbs can join in on the vacation fun. With a swimming pool, fitness center, and even bicycles available for rental, Summerlin offers its guests everything they need for a wonderful stay. 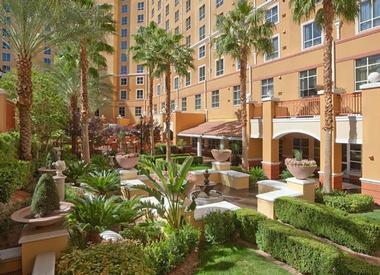 The Embassy Suites in Las Vegas offer two-room suites with living areas and enough sleeping space for the whole family. Its prime location is very convenient for those who wish to explore the excitement of the Strip as well as other attractions like Lake Mead or the Hoover Dam. Adults can enjoy complimentary drinks during the hotel’s evening receptions, and the whole family can indulge in a delicious free breakfast, made to order and offered each morning for guests. The fitness room, hot tub, and pool offer opportunity for entertainment, and if that’s not enough, there’s all the lights and fun of the city of Las Vegas just outside the door. 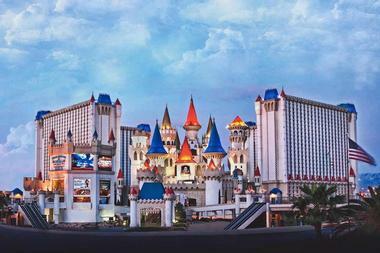 Excalibur Hotel and Casino is located at the southern end of the famous Strip, and it’s difficult to miss. Built to resemble a medieval castle, complete with rounded towers topped with colorful roofs, Excalibur is perfect for a family trip because it has everything needed for a one-stop vacation. On the lower level, there’s the Fun Dungeon, where guests can take part in classic arcade games, carnival games, and more. For a special treat, families can grab tickets to the Tournament of Kings, where they will be treated to a deluxe three-course dinner while watching knights in full armor astride their noble steeds in a jousting tournament that is as exciting as it is entertaining. The Excalibur is also home to a number of shows from huge international artists and performers, and schedules and tickets are available on their website. At the Golden Nugget Hotel and Casino, located in the midst of the 24-hour action on Fremont Street, visitors will find no shortage of amenities and activities. The hotel itself, with its bright lights and vintage vibes, was first opened in 1946 and prides itself on maintaining the classic Vegas feel. But that doesn’t mean it’s outdated. Visitors to the Golden Nugget will enjoy luxurious rooms, spectacular shows, a bustling casino, and delicious food. 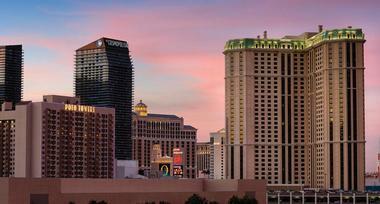 Just steps away from world-famous Vegas attractions like the Mob Museum, there’s also plenty to do at the hotel itself. Visitors can take a dip in the lagoon-style swimming pool, or if they’re feeling adventurous, race down a thrilling waterslide that passes right through a three-story shark tank. 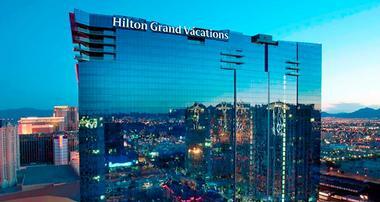 There’s no casino attached to Hilton Grand Vacations Club on the Las Vegas Strip, but for families with kids, that’s all part of the draw. This hotel’s status as a smoke-free venue without all the racy adult entertainment that can be found at a lot of other Vegas hotels makes it a favorite for families. The rooms at Hilton Grand Vacations Club are all suites, with multiple beds, full kitchens, and playpens and highchairs available by request. The amenities include a pool with a spraying fountain that kids will love and a game room equipped with foosball, table tennis, pool, and plenty of board games that will entertain everyone. The suites at Holiday Inn Club Vacations at Desert Club Resort are spacious, with living rooms, full kitchens, washing machines, and balconies available for guests. The resort is located on a 20-acre property about a block away from the Strip, with shuttles that will take guests to Vegas attractions and back again at the end of the day, so families with kids don’t need to worry about a ton of walking. There are five swimming pools for guests to enjoy as well as a poolside bar and grill, a game room, and a miniature golf course. The Las Vegas Marriott is located very conveniently, close to plenty of famous Vegas attractions, including the Las Vegas Convention Center, and it is also just steps from the Las Vegas Monorail, which travels the entire length of the famous Strip, so guests at the Marriott will find all that the city has to offer at their fingertips, while still staying far enough from the action that they will find a quiet, relaxing place to stay. The hotel partners with the Ethel M. Chocolate Factory, the Las Vegas Natural History Museum, and the Lied Discovery Children’s Museum, which are all nearby and offer great opportunities for families to explore. The Grand Chateau was inspired by southern France, with villas and suites that feel sleek and elegant. They are equipped with kitchenettes or full kitchens, washers and dryers, and other useful amenities. Guests can go for a swim in the hotel’s rooftop pool, which boasts a poolside bar and grill and a spectacular view of the bright lights of Las Vegas. The Marriott’s Grand Chateau is conveniently located right across the street from Planet Hollywood Resort & Casino and all the shops and restaurants there. It is less than a block from the Strip, so visitors staying at the Grand Chateau will find themselves in the heart of all the action.